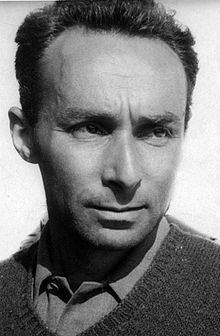 Primo Levi (31 July 1919 – 11 April 1987) was an Italian Jewish chemist and writer. He was the author of two novels and many short stories, poems and essays. His best-known book is If This Is a Man, a true story about his time as a prisoner in the Auschwitz concentration camp during World War II. Levi was an atheist and born in Turin. He committed (probably) suicide there by jumping down the stairwell of his house. ↑ David Keffer. "Primo Levi". www.themodernword.com. Retrieved 2011-11-11. This page was last changed on 31 October 2017, at 23:08.